Across Canada many community foundations are teaching young people about the charitable sector in their communities. High school students are learning the methods and techniques used by foundations to support charitable activities. 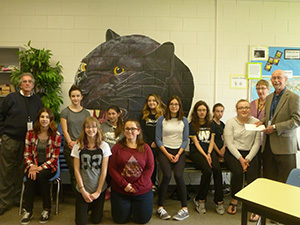 The Youth Advisory Committee of the Pinawa (Panthers) Secondary School gets off to a roaring start! In 2002, we established the Youth-in-Philanthropy project for students in rural and northern Manitoba (see Footnote). It is a three-way partnership including the Thomas Sill Foundation, the local community foundation and the local high school. The Youth Advisory Committees of the high schools each receive $3,500 annually for three years from the Foundation. These funds are deposited by the local foundation which entertains recommendations for grants to local charities from the students. 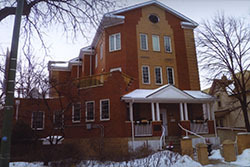 A designated high school endowment is also established by the students. The local foundation provides supervision and agrees to fund the program for a subsequent three years. 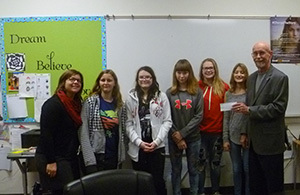 The first Youth-in-Philanthropy cheque is presented at Shoal Lake School. This brings our project to 38 high schools in 34 rural and northern communities. Our total investment is $388,500. To be sure, this financial investment has a significant multiplier effect in each community. But what cannot be quantified is the personal growth experienced by every student who participates and comes to appreciate the contribution of the philanthropic sector in one’s hometown. 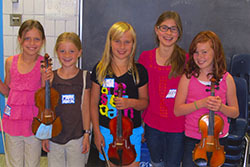 Footnote: The Winnipeg Foundation conducts a similar program in Winnipeg where it has worked with 34 high schools. Together, both foundations have served 72 high schools.